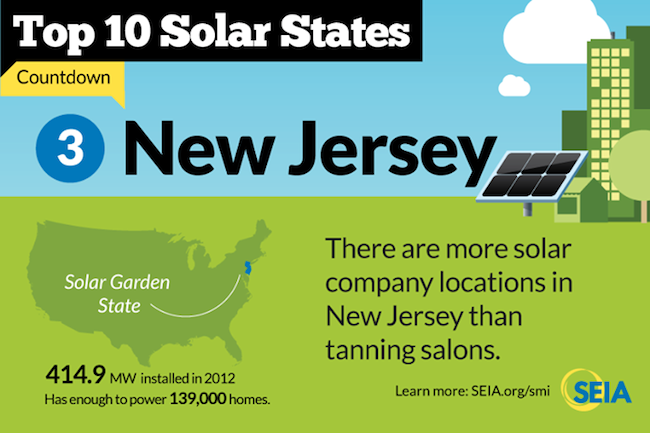 New Jersey has been one of the surprise solar leaders in the US, and even globally. In terms of installed solar power per capita, only 10 other US states and countries beat it. The three states that are above it have much better solar resources. New Jersey solar incentives are, of course a big part of New Jersey’s solar leadership. Solar Renewable Energy Certificates (SRECs) have certainly been a big part of New Jersey’s solar leadership. To start with, it’s worth noting that New Jersey’s renewable portfolio standard (RPS) is the key driver behind SRECs. The RPS requires utilities / electricity providers to make sure that 20.8% of the electricity each of them sell comes from specified renewable energy resources by 2021. 4.1% must come from solar power by 2028. These are some of the strongest RPS requirements in the country. In order to meet these requirements, utilities buy SRECs from solar power producers (including residential ones) and “retire” them. It’s worth noting that supply & demand have strong influence over this system. When supply increases, the price offered for SRECs goes down, reducing the installation of new solar power systems. When demand increases, the opposite effect occurs. This has resulted in some boom-bust cycles in the New Jersey solar market. For a lot more details on the New Jersey SREC market, check out the link above. Solar loans from PSE&G have been offered for years. The latest version of the incentive has offered loans covering 40-60% of the cost of PV systems. “A loan term of 15 years is available to non-residential customers at an interest rate of 11.3092%. Residential customers are eligible for a loan term of 10 years at a 6.5% interest rate.” The loan program was earlier this year renewed, and the new version should soon be unveiled, so the details above are not necessarily up to date, but it is expected that the offering will be similar if not the same as the previous incentive. “The actual maximum loan amount is based on how much energy they system is expected to produce over the term of the loan. The program website contains a loan calculator tool for this purpose. Loans are only available to systems of 2,000 kW DC or less that are eligible for net metering and to generate Solar Renewable Energy Certificates (SRECs) under state rules.” The incentive is available to just about every type customer (if not every one). All solar equipment is also exempt from New Jersey’s sales tax. Yep, if you buy any solar energy equipment, it is not subject to the state’s 7% sales tax. “All major types solar energy equipment, including equipment for passive solar design, are considered eligible for the exemption as described by the New Jersey Division of Taxation Publication S&U-6 (Sales Tax Exemption Administration).” However, there are some things worth noting: the sales tax exemption doesn’t apply to equipment that would be needed no matter the energy source, and “the purchaser must fill out and submit Form ST-4 (Exempt Use Certificate) to the seller instead of paying sales tax.” So, it’s not a given that if you buy solar equipment, you won’t pay the sales tax — you have to actually complete and submit the exemption certificate. Rebates! A couple of different rebates for solar equipment are available in New Jersey. For residential gas customers, a $1,200 rebate is available for customers who buy Energy Star–qualified solar domestic water heaters. Customers who have an electric water heater are also eligible for a $1,200 rebate (per system). As always, the federal tex credit for solar power systems also applies in New Jersey. The tax credit allows customers to take a 30% tax credit for their solar power expenditures. There is no longer any maximum financial limit on that tax credit, thanks to an amendment implemented in February 2009 by The American Recovery and Reinvestment Act of 2009. This countrywide solar energy incentive is currently available through December 31, 2016. There are also incentives just for non-residential sectors as well as incentives that are now over (some of which could return). For more details on renewable energy incentives, DSIRE is the place to go. To get an estimate of how much it would cost you to go solar, and how much money you’d save by going solar, zip through the short questions on our homepage. There are currently more than 435 solar companies at work throughout the value chain in New Jersey, employing 5,700. In 2012, New Jersey installed 419 MW of solar electric capacity, ranking it 3rd nationally. The 1,119 MW of solar energy currently installed in New Jersey ranks the state 3rd in the country in installed solar capacity. There is enough solar energy installed in the state to power 160,000 homes. In 2012, $1.3 billion was invested in New Jersey to install solar on homes and businesses. This represents a 8% increase over the previous year, and is expected to grow again this year. Average installed residential and commercial photovoltaic system prices in New Jersey have fallen by 27% in the last year. National prices have also dropped steadily— by 11% from last year and 34% from 2010.